The walls of our restaurants are filled with one-of-a-kind Zachary’s Pizza Art. We held our first art contest in the late 1980′s and the tradition has continued every couple of years since. We love our art and the artists. Ladies and Gentlemen, meet Zoë Boston! My name is Zoë Boston and I have been creating art of many forms since I was a little girl. Currently, I am a singer/songwriter/rapper/painter and am in a music group called “Team Zoe”. We perform down town every month at Oakland’s First Friday’s! 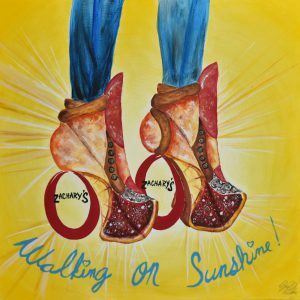 “Walking on Sunshine” was inspired by my passion for food, visual art, and fashion. I love the challenge of combining the three to make tasty looking masterpieces. 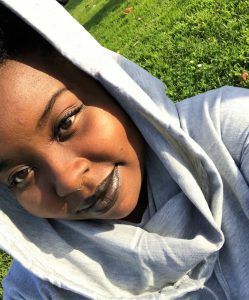 I believe Great food, great art, and great fashion have the power to uplift your spirits and truly make you feel like you’re walking on sunshine! I’m so pleased in knowing that my art was chosen to grace the walls of one of the best pizza places in the Bay Area. I was born in Los Angeles, CA, raised in upstate New York, and have lived in the Bay Area for about four years now. I love almost everything about the Bay Area. It’s beauty and diversity is something truly unmatched and the food, culture, and fashion are eclectic. My favorite go-to Zachary’s pizza is a medium deep dish with pineapples, sausage, and ricotta cheese. I always put ranch and extra parmesan cheese on top! So good! I enjoy treating my friends to some Zachary’s over a good conversation. I will continue to enjoy Zachary’s and plan to participate in the art contest for years to come.